While most little kids were sleeping in their beds safely, an 8-year-old boy decided to take a joyride with his 5-year-old sister in their mother’s minivan. According to the boy, his sister wanted to go to the grocery store and being the good big brother he was, he took his mother’s keys, buckled his sister in and headed off. 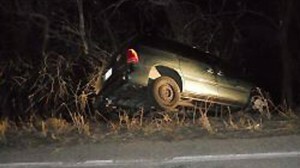 Thankfully, they didn’t get very far and no one was injured in the late-night trip last night. Unable to see over the steering wheel, the mini driver only made it a few hundred feet before crashing the vehicle into a line of trees along the Ogden Rivers. Justin McDonald, 18, heard the crash and ran outside with a friend to see what had happened. Another neighbor, Holly Maxwell, 25, also heard the crash and ran out to help. Ms. Maxwell held the 5-year-old’s hand until authorities arrived and both McDonald and Maxwell accompanied officers to the children’s house. When the officers arrived at the home, they knocked several times, but no one answered. Finally, they just walked into the apartment. McDonald said that, once in the apartment, the officer “called her name like four or five times.” Finally, she emerged from a back room and found her apartment full of police officers.